Tents can protect your event in any weather, from the heat of the sun in the summer to the howling winds of autumn, to the cold snow in winter. Simple canopy configurations may be set up outside a venue to shield guests from the weather and announce the location of your party. High peak tents are eye-catching and elegant. 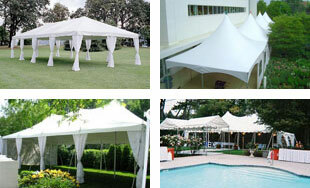 Frame tents can be huge to accommodate the largest of crowds. Whatever the size and location of your event, we have a tent or canopy that will suit you! Among our inventory we include Navitrac® Clear Span Tents, Century Mate® High Peaked Pole Tents, hexagonal and peak marquee frame tents, as well as pole canopies, designed for easy customer setup. Available in a multitude of sizes, the tents we rent at ABC Rental Center are top-quality from popular manufacturers, and can be configured with walls, doors, windows, & gutters to perfectly accommodate your guests. Our professional installation team will deliver and set up your tent quickly and efficiently, removing all worry from your mind. Want to DIY? No problem! If you order a pole canopy we provide step-by-step directions for easy set-up. We have our own tent washer so you know we will supply you with a clean product. Please click here to view our extensive inventory of tents and canopies. From a single canopy to mid-size tents to massive configurations, we have the widest selection of tents & canopies for rent in the Cleveland Metro Area. Give us a call today for a quote!